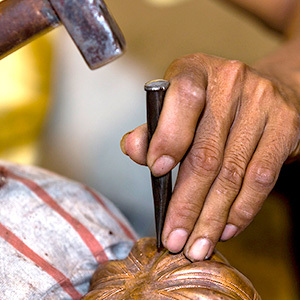 This magnificent piece was entirely made by hand. 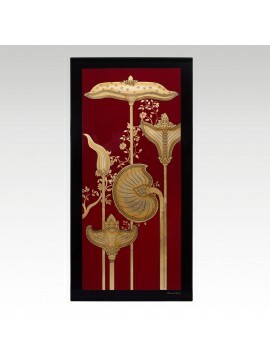 This piece is one of our most outstanding lacquered panel its represents countless hours of meticulous work. 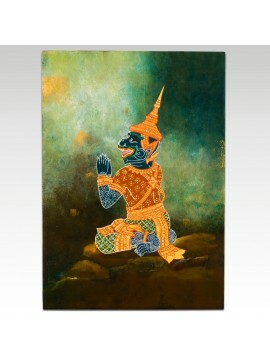 It depicts Sokrip, a legendary character of the Reamker, which is a Cambodian epic poem based on the Ramayana. 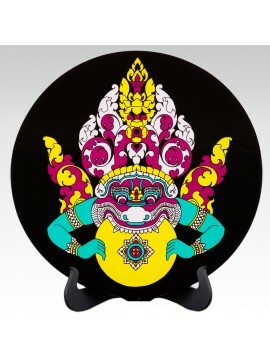 This piece totally made by hand (lacquered painting on wood). 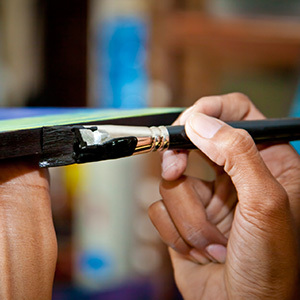 The technique used to bring a delicate light to this lacquered painting is particularly outstanding. 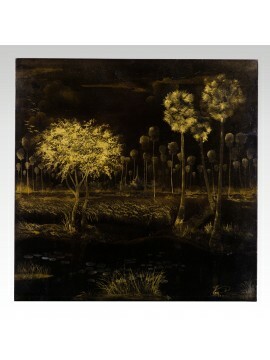 It depicts typical features of Cambodian countryside landscapes: palm trees fields and a lotus pond. 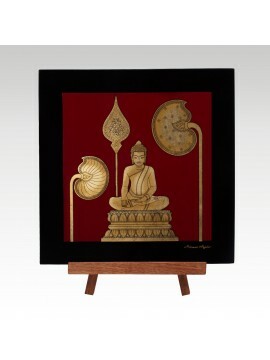 Rea Hu panel This elegant panel would suit any modern lifestyle and still remains a vibrant tribute to the Khmer culture. 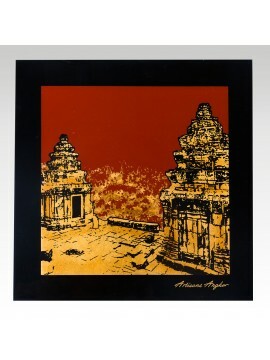 This very attractive lacquer painting of umbrellas shows the style of umbrella that is depicted on many of the bas-reliefs to be found in the old Angkor temples. 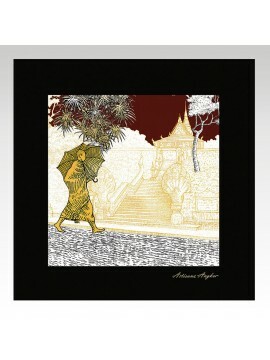 They are ornate and stylized umbrellas of the type used to shade kings, royalty and important personages. 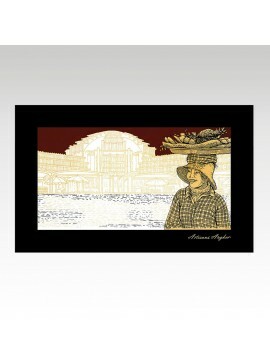 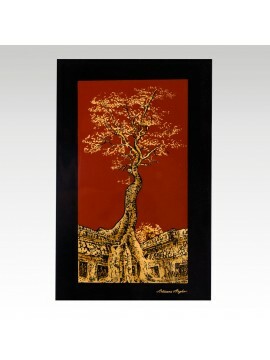 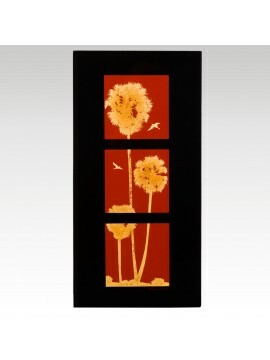 The picture is in red and black lacquer with copper leaf. 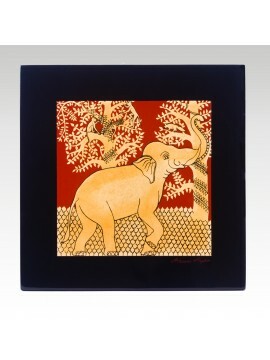 This beautiful piece is part of a series of skillfully lacquered panels depicting some of Cambodian renowned animals. 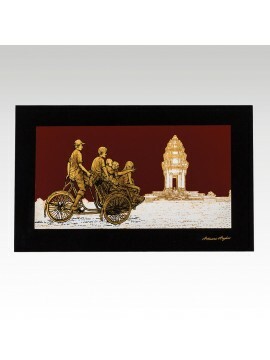 Elephants and their babies have a very prominent place in Cambodian stories and culture. 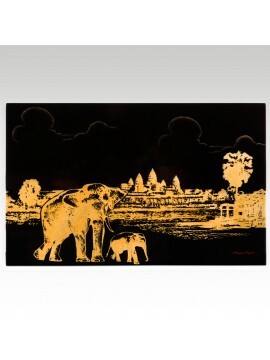 This luscious painting of a mother elephant with her cub in front of Angkor Wat, has been depicted in black and red lacquer and further decorated with fine copper leaf, then coated with a clear lacquer to preserve and protect the painting. 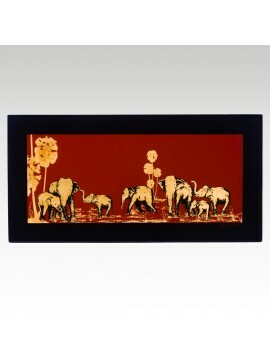 This piece has been carefully painted with lacquer, which was then loyally rendered in fine copper leaves to produce a lusciously warm finish on a traditionally black background. 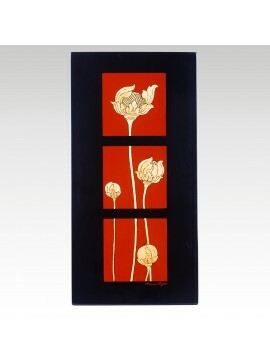 At first glance, this lacquer painting of three Apsaras on lotus may simply appear to be a beautiful piece of artwork. 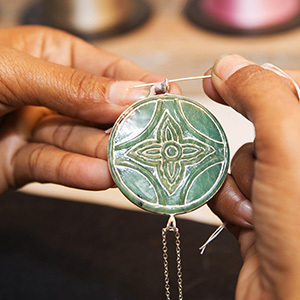 However, there is significance to even the smallest detail on this lovely item, adding symbolism to its loveliness as well. 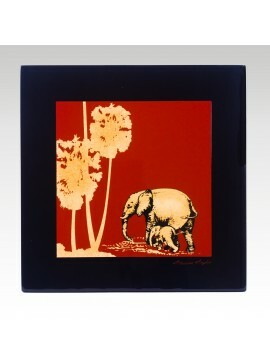 This lovely lacquered painting is part of a series that show the traditionally known Cambodian animals. 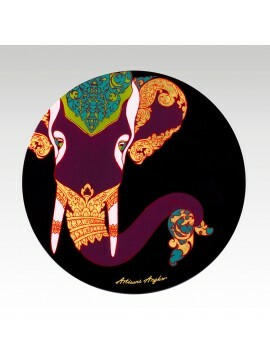 This beautiful painting of an elephant is part of a series of tributes to the traditional animals of Cambodian culture. 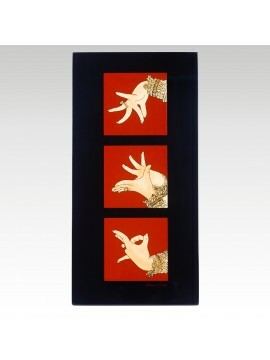 This lacquer painting is a stunning rendition of three of the hand movements used in traditional Khmer dancing. 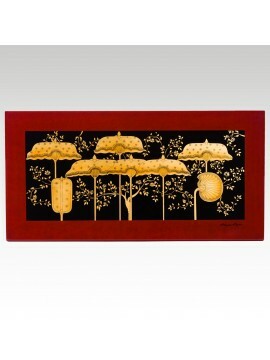 Whatever your decor is, this lacquered panel with its palm tree motif in 3 sections is likely to find its place. 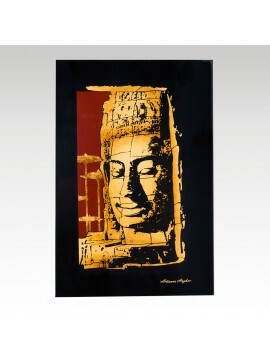 Designed and hand crafted in one of our Siem Reap workshops in Cambodia, it will bring a touch of Asia into your home. 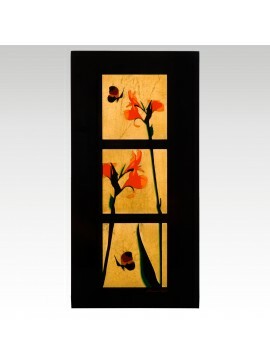 Whatever your decor this lacquered panel with its floral motif in 3 sections is likely to find its place. 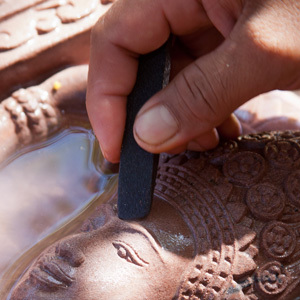 Designed and hand crafted in one of our Siem Reap workshops in Cambodia, it will bring a touch of Asia into your home. 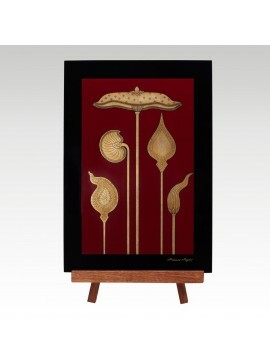 The Lacquer panel of Apsara Holding Lotus Flower is a fine piece of art made by skillful artisans. 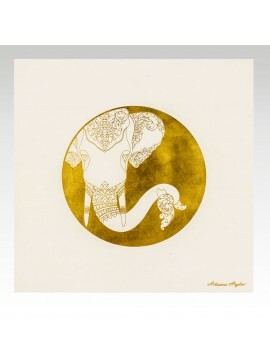 It represents this mythological female creature which is compared to angels because of her beauty and which has the power to change into infinite shapes. 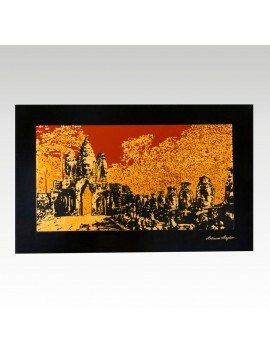 The lacquer painting Bayon face is a representation of the Khmer temple situated in Angkor in Cambodia. 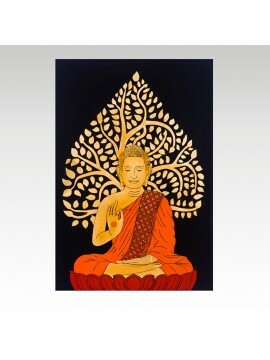 This gorgeous lacquer painting of Buddha under a tree is both beautiful and symbolic. 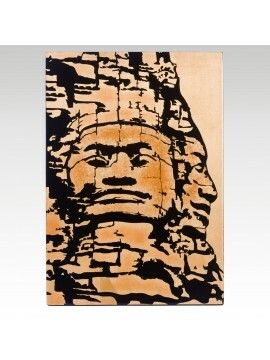 Deep, rich shades of orange and red are striking against the black lacquered background with a serene, smiling Buddha in the center of the piece.